Every deed, mortgage, or other conveyance in writing that is signed by the party making the conveyance, the grantor (or grantors) being of full age and sound mind, is sufficient to give, grant, sell, mortgage, lease or otherwise convey any lands, tenements, or hereditaments in Illinois (765 ILCS 5/1). A conveyance of real property in Illinois can be in a form prescribed by section 765 ILCS 5/9.The customary form for a conveyance of real property in Illinois is the warranty deed, but many forms, such as a warranty deed from an individual to a corporation, a quitclaim deed for joint tenants, and deeds in trust, are used in this state. In order to convey property in this state, the grantor must be of legal age (18) and of sound mind. The property ownership laws further state: All aliens may acquire, hold, and dispose of real and personal property in the same manner and to the same extent as a citizen of the United States (765 ILCS 60/7). A person claiming right or title to land, even though he or she may be out of possession and notwithstanding there may be an adverse possession thereof, may sell, convey, or transfer his or her interest in the same in as full and complete a manner as if he or she were in actual possession of the property (765 ILCS 5/4). Title between co-owners in Illinois can be held in three different ways: as tenants in common, as joint tenants with the right of survivorship, or as tenants by the entirety. Additionally, property can be conveyed by joint-owners, individuals, and corporations. The way in which title is held, along with the intentions of the parties involved, will determine the method of conveyance. 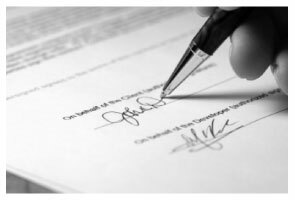 In Illinois, a real estate deed must be signed by the grantor, and acknowledged or proved in order to be recorded. The acknowledgment or proof of a deed, mortgage, conveyance, power of attorney, or other writing that relates to the sale, conveyance, or other disposition of lands, real estate, or interest therein whereby the rights of any person may be affected, can be acknowledged or proved as follows: If acknowledged or proved within Illinois, the act may be done before a notary public, U.S. commissioner, county clerk, or any court or judge of such court. When acknowledgements are taken before a notary public, it should be attested by the notary's official seal; and when taken before a court or the clerk of a court, the acknowledgement should be attested by the seal of the court. Acknowledgements can also be taken out-of-state, as described in 765 ILCS 5/20 of the Illinois Statutes, and will be valid for recordation in Illinois. No judge or other officer should take the acknowledgment of a person unless the person offering to make such acknowledgement is personally known to him to be the real person who and in whose name such acknowledgment is proposed to be made (765 ILCS 5/24). Witnesses are not required on a conveyance in Illinois. No release or waiver of the right of a homestead by a husband or wife will bind the other spouse unless such other signs the release or waiver (765 ILCS 5/27). A transfer declaration must accompany all deeds submitted for recording. Further requirements are listed in765 ILCS 5/35c. For complete local and state guidelines regarding recording and recording fees, visit the Illinois Recorder Section. Deeds, mortgages, and other instruments relating to or affecting the title to real estate in Illinois should be recorded in the county where the property is located. All deeds and other instruments of writing that are authorized to be recorded will take effect and be in force from and after the time of filing the same for record, as to all creditors and subsequent purchasers without notice. The instrument is void as to all such creditors and subsequent purchasers without notice until it is filed for recording (765 ILCS 5/30).